My setting has changed this weekend. Shelley, my pet parent, has taken me to her dad’s house, where I will be staying for three weeks. I am not sure about changing my exterior world, though there are a few advantages to being here. I love the big backyard and chasing after feral cats and wild birds that, I believe, should want to be my friends. I love running along the fence and barking up a storm, rabble rousing the neighborhood into making noise alongside me. And I love getting attention from a whole new set up people. Plus, Shelley’s dad is a good play buddy who wrestles with me on the floor, plays chase and tosses the ball in the air for me to catch, which I can do two out of three times (if I’m trying). I am attached to Shelley. I want Shelley to come back. 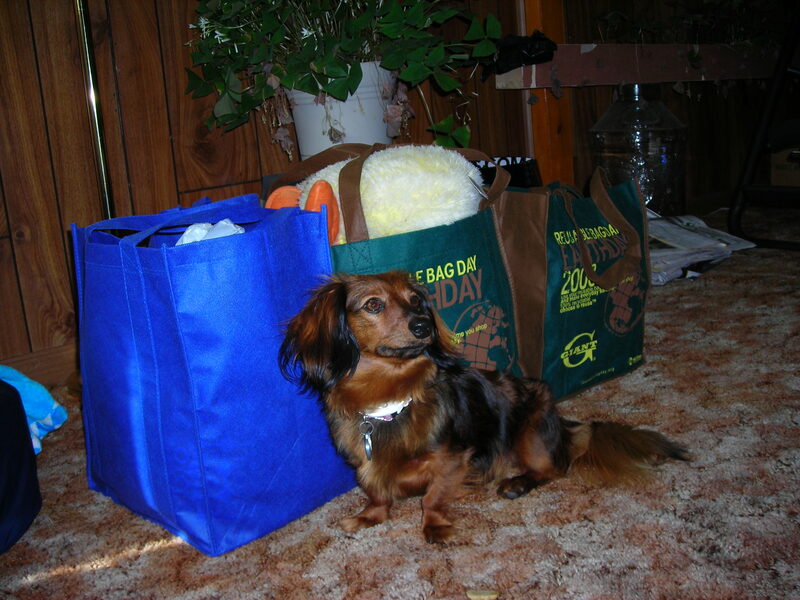 To demonstrate my sadness, here is a photo from a previous time when Shelley left me at her dad’s. As you can see, I look quite sad. Bark! I just heard a noise. I’m off to run around the backyard, come inside for a treat and play off my cuteness to engage Shelley’s dad in play. I'm pretty as a picture. As a dang cute mini-dachshund, I have quite the character. I love getting pets and treats, and I like to play tug-of-war, chase and keep away. But that’s what I like to do. Who I am is a different matter. I am a 9.5-pound bundle of cute. In fact, I am the CEO of cuteness. As the main character of cute, I am supposed to have a minor flaw. Hah! Me? Shelley, my pet parent, would say I bark too much. Dogs are supposed to bark. Small dogs like me also should bark at big dogs to let them know who is the boss, or the CEO. 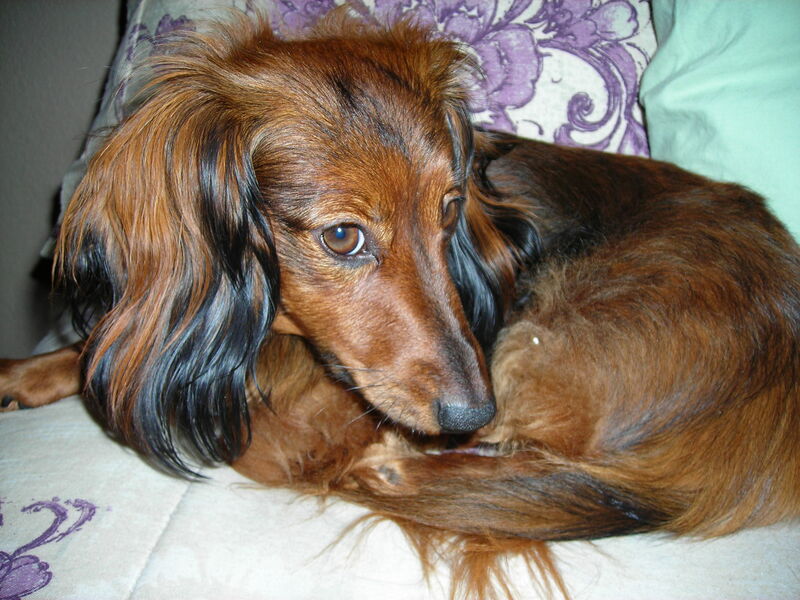 To describe how cute I am (though my picture tells a million words), I have black tipped ears, eyeliner-like lined brown eyes and a long, lean body (think wiener dog). I am playful. I love to run. I love to chase and be chased. I am on the constant lookout for friends, human and animal alike (well, except for cats). And I am 100 percent lovable. Can’t you tell from my photo? I think the hook into the story of my life is obvious. It’s the fact that I am a cute dachshund with a big personality. I love, love to play. I get a kick out of treats. And I’m blessed with the softest (and prettiest) coat that makes other dogs (and cats) jealous. Aren't I cute as heck? 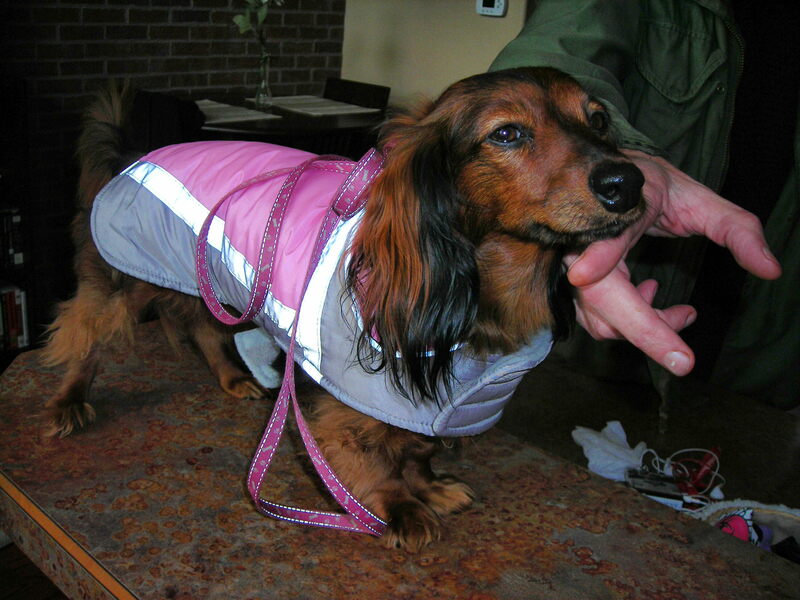 I'm all decked out in my winter jacket, plus I'm irresistible for petting. 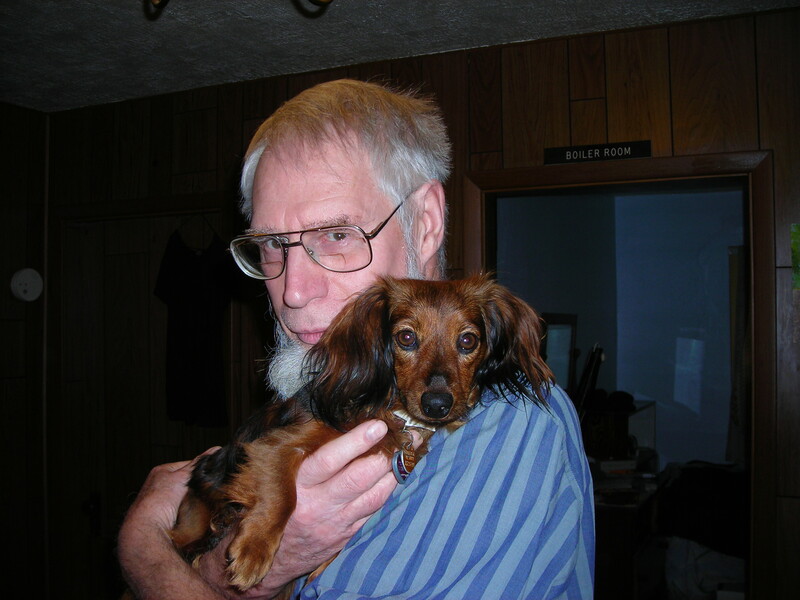 As you can see, I'm so lovable, especially with Grandpop. I am excited to tell you that I got a new Frisbee. As Shelley blogs about writing, I am chewing my blue plastic Frisbee to pieces. I know that it’s for throwing, but I prefer to bite off the edges or, in the case of balls, pull off the strings, erasing the toys’ effectiveness as objects to be thrown. I’m kind of smart that way. If I chew away at something, then I don’t have to chase it. Even though as a dachshund, I like to chase things, preferably balls and my teddy bears, I get tired of doing the same old thing over and over again. Plus, when it comes time to reflect, I do my thinking with my teeth in motion. It’s a contradiction that boils down to my liking to chase things – but only once. If Shelley throws a ball, I’ll eagerly go get it and bring it back, well not to her exactly but within her vicinity. That way, she has to work to throw it again. I’m trying to let her know that I’m not interested in do-overs. As I chew on this idea, Shelley is blogging about plot, or the structure of a story from beginning to the middle and the end. My days have no plot, but they do have a beginning with me waking up and wanting some of Shelley’s breakfast, a middle with her going off to work and leaving me all alone, and an end with Shelley coming back and playing with me. My life is like a Frisbee that gets thrown and I bring back, just as I wait for Shelley to return from work. It’s an endless circle, but by chewing on the outer edges of that circle, I create something that won’t fly through the air. In other words, I’m retelling the plot of a dog’s life through the action of my teeth. 2011 was a year of play, seeking attention and finding the fun in a daily dose of being the cutest dachshund this side of theMississippi. The end of the year offers a time for reflection, but being a dog, I don’t focus too much on the past. I’m all about the present. I’m also about presents, as you can see in this photo of my opening my presents on Christmas Day. 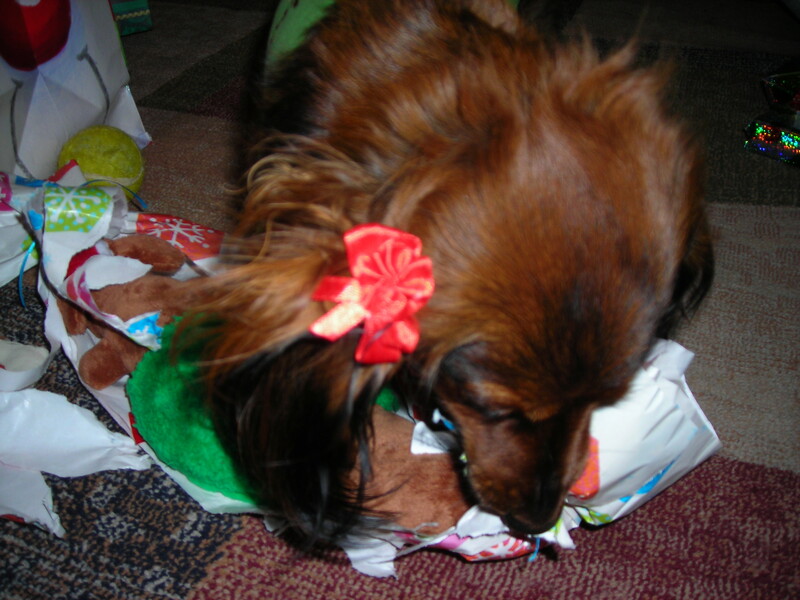 Zoey opens her presents one after another on Christmas Day. * I’m not supposed to bark at big dogs. * I’m not supposed to bark at noises in the middle of the night and wake up Shelley. The problem is I like to bark. * I’m not supposed to be selfish with my toys when I play with other dogs. In other words, I’m supposed to share. * I’m supposed to sit when I want to beg for treats. * If I sit beside my toys, Shelley will get the hint and play with them and me. * I can catch balls. * I can carry doggie teddy bears that are larger than me. * I can stand on my hind legs. And I can be ultra, extra, exceptionally cute. In 2012, I will be blogging about the life of a dog, what I learn and what I like about being furry and fou-legged. I’ll continue with my canine poetry and try my paw at writing a dog story or two.